We have all asked the question or at least given thought to…. Based on this chart, I’m somewhere around Waist Length. Yay! My personal goal is/was MBL so reaching WL was more than I set out to do. Truth be told, I’ve been here before but cut back to APL due to a >>setback<<.As you can see, the hemline is not looking all that great. This really annoys me because I love an even hemline, not to mention, my mission is “health before length.” I was determined to do a deep cut and even things out. However, I’ve decided to hold off for now to see if things fill in and even out between now and December. I will then re-evaluate and make a decision. 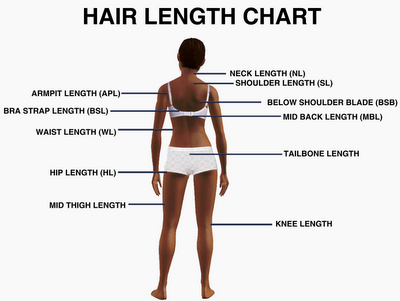 When Was Your Last Length Check? wow! you are at WL! love the blog too! Thank you so much 🙂 Please do visit again. oh and i’m currently a little past NL at the nape and i’m SL in crown and sides. i am 14 weeks post. hopefully, with my next length check, i will be SL in the back. i plan to do another when i touch up my new growth. i haven’t decided when i will do that yet! Good luck to you. Here’s to reaching SL in the back. Beautiful! I too am always on the quest for achieving and more specifically MAINTAINING the perfect hemline. We’ll see what happens after my touch up this week. The hemline is no joke. Mine always end up being uneven beyond mid back length. Woop Woop!! WL! Congrats chica! I’d definitely hold off on the deep trim until you are mentally ready for it. Well done WL, my dream length! My last touch up I was at APL but I have trimed it back to SL. I would also say don’t cut it now! But wait, why did you cut yours?